In January 2019 the Government labour force increased by 492 persons (1,0%) in comparison to the corresponding month of 2018 and reached 51.113 persons. Permanent staff decreased by 538 persons (-1,5%). Casual staff increased by 6,9% and reached 15.925 persons compared to 14.895 persons in January 2018. 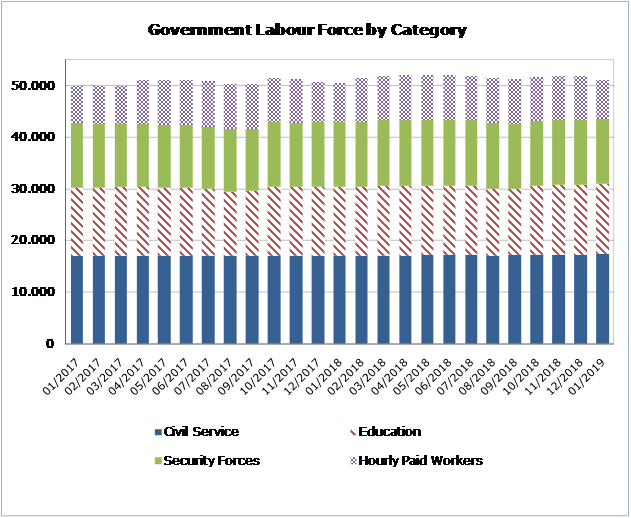 Compared to January 2018 there is an increase in all the categories of government labour force except in the category of Hourly Paid Workers. The largest increase is observed in the Civil Service (1,6%) in which the casual staff increased by 6,3% (349 persons). Compared to December 2018, the staff of the Civil Service increased by 0,9% (159 persons) while the number of persons in Education decreased by -0,1% (-12 persons), the Security Forces by -0,4% (-49 persons) and the Hourly Paid Workers by -11,3% (-959 persons). Government includes Civil Service, Educational Service, Military Personnel and Hourly Paid Workers. Civil Service includes the staff (either permanent or casual) of the Ministries, Departments and Services. Educational Service includes the permanent and casual educational staff that is occupied in school units and the staff of Cyprus Productivity Center and the Higher Hotel Institute of Cyprus. Military Personnel include Police Service, Fire Service and the National Guard. The members of the House of Representatives are not included. Data concerning employment in Government is provided from the Treasury and refers to the number of persons that were paid in the current month.